SAN ANTONIO, May 4, 2017 – In partnership with the Small Business Administration (SBA) San Antonio District Office, the UTSA Institute for Economic Development and South-West Texas Border SBDC Network gathered to recognize the 2017 District Small Business Week winners for an awards ceremony at the Omni San Antonio Hotel at the Colonnade. Every year since 1963, the President of the United States has declared National Small Business Week to recognize the important role and contributions of America’s small businesses. National and local events recognize top entrepreneurs for their achievements to include those individuals and organizations who champion small business. During today’s ceremony, special recognition was given to SBA resource partners and community organizations for their outstanding efforts in business and entrepreneurial development. Hosted by the UTSA Institute for Economic Development, the South-West Texas Border SBDC Network, and the SBA San Antonio District Office, the event gathered members of The University of Texas at San Antonio, the small business community, representatives from major lending partners, economic development corporations, the Texas Workforce Commission, and the Office of the Governor. “The San Antonio Small Business Week Awards continues to highlight the successes of the awardees and the impact of the small business community on the Texas economy. 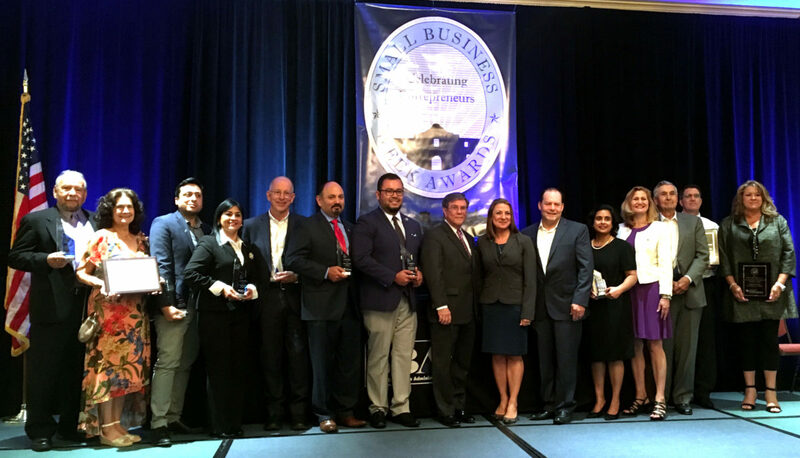 We congratulate the 2017 San Antonio Small Business Week award winners for their commitment to growth and their recognized success,” said Al Salgado, executive director of the UTSA South-West Texas Border SBDC Network. This year’s National Small Business Week takes place from April 30 – May 6. Photo Caption: The 2017 SBA San Antonio District Small Business Week winners gathered at the close of an awards ceremony, held in their honor, on Thursday, May 4 at the Omni San Antonio Hotel at the Colonnade. Anthony Ruiz, district director for the SBA San Antonio District Office and Lindsay Dennis, community relations for the Office of the Governor, posed at center with the awardees. The SBA San Antonio District Office and the UTSA South-West Texas Border SBDC Network hosted the event.